Hi, there! 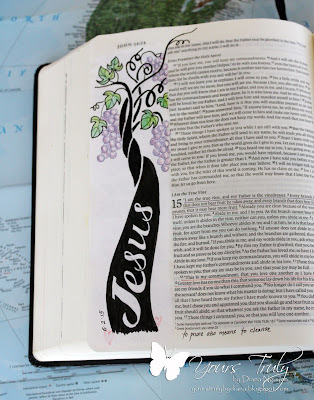 I hadn't posted about Bible journaling in a while. I found myself more interested in the artistic part of it and less in the devotion and meditating on the verse so I had to quit for a bit until I found my focus again. A couple of weeks ago I was reading a devotion about how our God is a jealous God and how that seemed like a bad characteristic. If you called someone jealous, that certainly is not a compliment! But in Hebrews, that same word can also be translated to zealous. He is zealous for us! God is jealous for your heart, not because He is petty or insecure, but because He loves you. In the Bible, the words jealous and zealous are basically interchangeable — it’s the same Hebrew word in the original texts. In English, we spell the two almost the same because they derive from the same Greek root. We think of zeal as being intense enthusiasm. That idea captures why God is so possessive about us: He is, as He says, a consuming fire of passion for us. 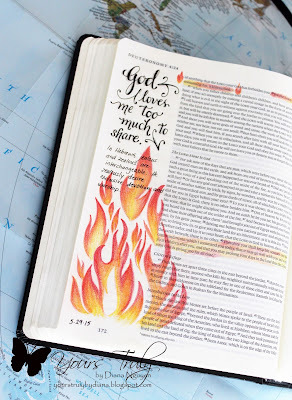 So for Deuteronomy, I knew I wanted to draw a fire in the margin of my Bible. I had been pinning ideas all along so I was happy to put pen to paper. I also thought I'd share my process for some of my other pages. 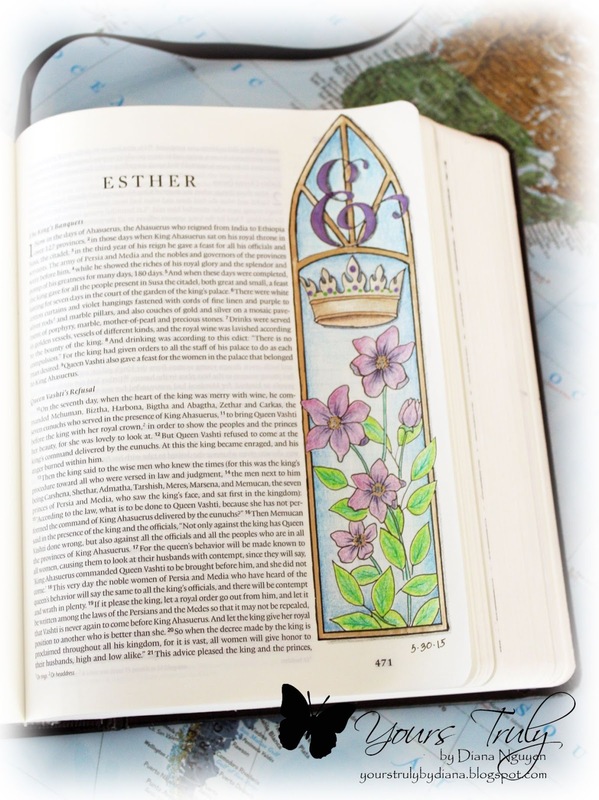 Title page for Esther: There is a drawing on my Pinterest board Bible Journaling of some flowers that were just perfect for a tall narrow space. I took the idea (flowers for beauty as Esther was), elongated it, colored it purple for royalty (that's just the color I think of for royalty), added a crown for a queen and then an E for a monogram. I used my Derwent watercolor pencils (without water), gold gelly pen, and black Micron pens. This next one with a stack of books is almost a complete CASE of a drawing by Amy Horan. I did my own lettering and then colored it. 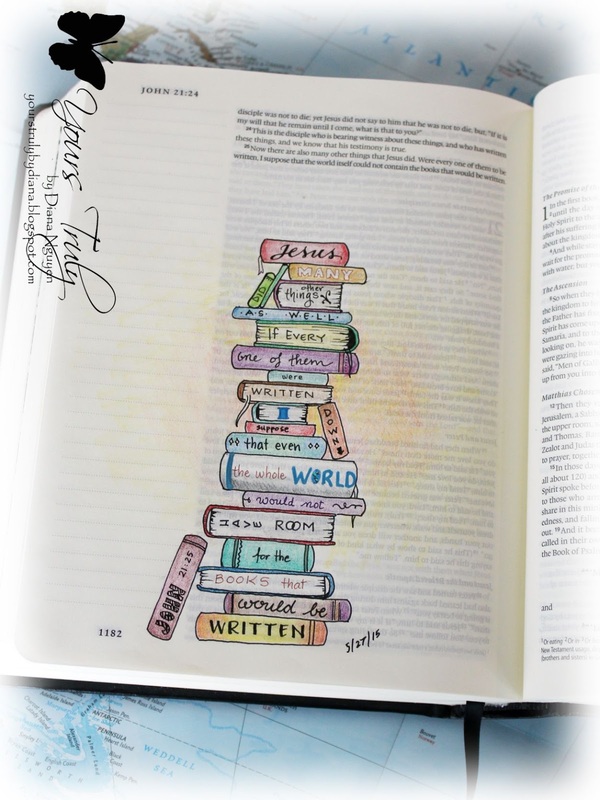 I love books and I will probably do something similar for Ecclesiates 12:12. The next two pages were a compilation of ideas. Dina Kowal had made a video where she had masked a single word to emphasize it on a page. But these two pages had many words that I wanted to stand out! To make my own letter masks, I found that if I used blue painter's tape on wax paper, I could make my own stickers that weren't too sticky. This was labor intensive but as I did it but as I dwelled and worked on each word, it really soaked in and I have it totally memorized! :) I used Lawn Fawn Quinn's alphabet dies to cut them out. I used some old Stampin' Up! inkpads to sponge and highlight my words. The ink did not bleed through the page so it was perfect. I also love this method because I can still read all the words on the page. Our pastor is preaching through the book of John so of course it was that week's journaling. This was also a CASE of another pin from my board. I changed it a bit to fit the space in my Bible. Before I did it though, I prepared my page with white gesso because I had worked on the previous page earlier. Our pastor takes a long time to go through the whole book as he does not skip any verse and some verses stand out more than others. I could see some ghosting on the pages and I knew that my vine would definitely bleed through the back so I prepped it with gesso first. It did not affect the other side and allowed me to ink heavily on this side. I used Derwent colored pencils and my Micron pens. As a personal preference, I do not like to work on gesso. I like to sketch my image or lettering first and it just does erase well. There is also the added texture which I don't like usually. So now I go ahead and do a page as is and if I need to, I'll add gesso to the other side. The Jesus on the vine did not show up as cleanly as I would like after I colored the black in so I took a white gel pen to clean it up some. The backside of this page done back in March: It still looks the same even after all that black ink on the other side. I love your illustrations! 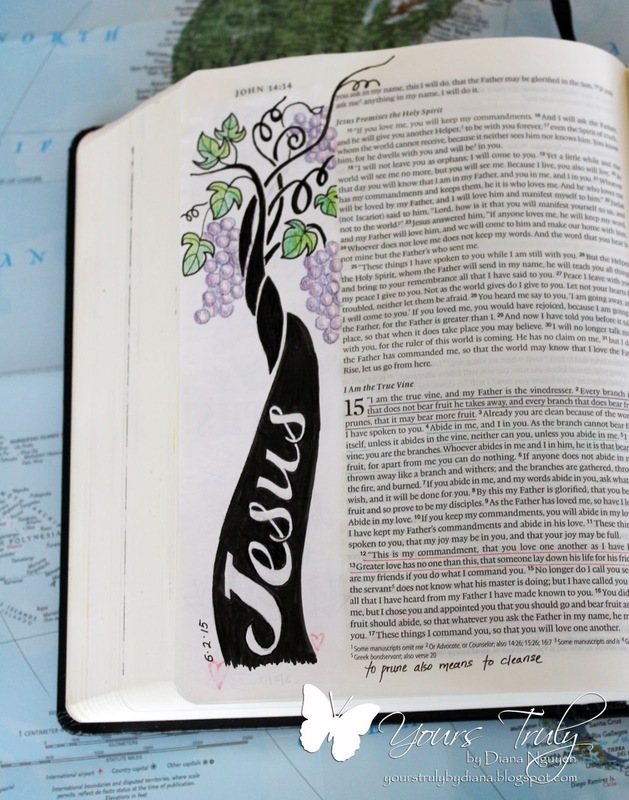 I don't have a journaling bible yet but I plan on using an artist sketch book. Thanks for the inspiration! 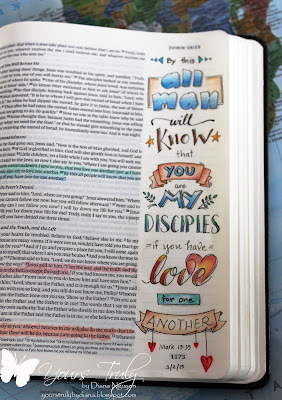 I would never have thought do to something like this to a bible, but you did a wonderful job with these illustrations. Beautiful colors and scripts. Thanks! 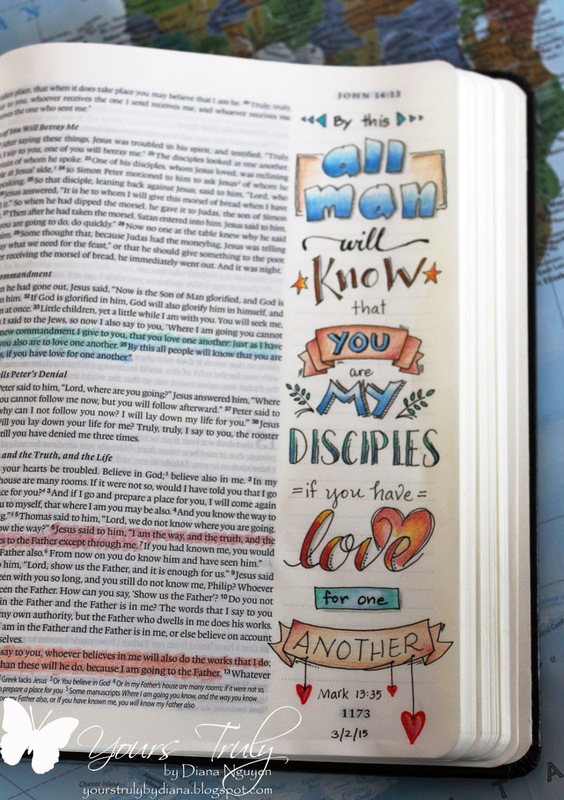 There was some hesitation at the beginning to "draw" in a Bible but I am loving how personal it is becoming. 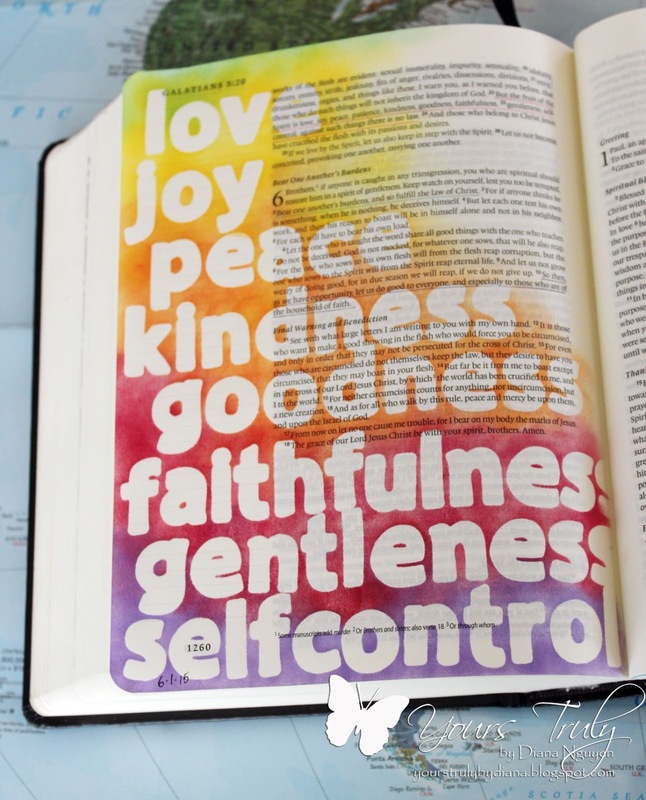 What kind of bible are you using Diane? I have been wanting to do this but have been looking for a single column journaling bible like the one your using. Thanks for any help. You really have inspired me to think I might can do this too. LeAnn, I'm using the single column ESV Journaling Bible. I got it on Amazon. 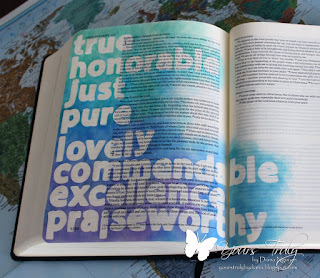 Absolutely beautiful and inspiring journaling. Your pages look so beautiful! Thanks for sharing your pages. They are beautiful and I will use them for inspiration if you don't mind. Great post! 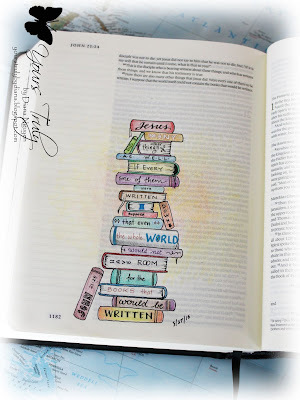 Awesome illustration and I agree with you 100% , our time in GOD'S WORD MUST BE about HIM not about the art. (Though I absolutely love the art process and creativity that we're inspired to illustrate :) Thank you for sharing this; it was helpful.